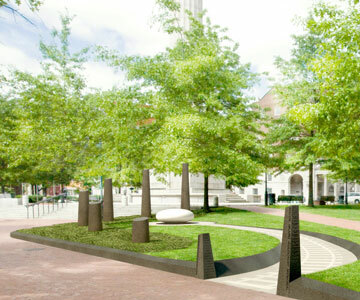 Designed by Rhode Island School of Design-based sculptor Jonathan Bonner, The Rhode Island Holocaust Memorial consists of four elements: the Entrance Gate, the Path, the Life Stone, and the Memorial Columns. Situated together on a triangular piece of land, these four key components symbolize different aspects of the Holocaust and its Jewish victims. The Entrance Gate consists of two black granite posts. As you enter the Memorial, the taller post is inscribed with a quotation from Roman Kent, a Holocaust survivor which was taken from his remembrance speech at the 50th anniversary of the liberation of Dachau. Just past the Entrance Gate is the Path, which is inlaid to simulate a train track. During the Holocaust, a significant percentage of those killed in the death camps were “relocated” by train. The train track has come to represent these forcible deportations and the resulting exterminations during the Holocaust. Along the length of the Path, its width and the inlaid track slowly diminish, ultimately by half of their original size, symbolizing the loss of the Jewish population in Europe during the horrors committed by the Nazis from 1933 to 1945. At the end of the Path is the Life Stone which sits at the highest point on the site. Made from light gray granite, the Life Stone represents the survivors, the unbounded spirit of life, and the continuance of a people and a tradition. Some draw a comparison to a small rock or pebble left on the gravestone of a loved one as is the custom for some in Judaism – symbolizing the permanence of memory. The last component of the Rhode Island Holocaust Memorial is the set of six vertical Memorial Columns that represent the six million Jews who perished in the Holocaust. Although all of the columns are the same shape, each is a different height as if cut short by one swipe of a blade. They represent the six million individuals, all at different stages of their lives, who were cut down by the singular evil. Some see in the truncated cones the smokestacks that carried the ashes of those killed in the camps. These vertical stones are a memorial to all of the men, women and children who perished. The Rhode Island Holocaust Memorial is designed to be a peaceful place of reflection and remembrance for all people – as well as an important source of knowledge about the Holocaust for all generations.